79-year-old Weepin' Willie (Robinson) may very well be the best classic R&B singer you've never heard of, unless of course, you happen to live in the Boston area. 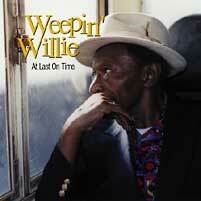 There, Weepin' Willie is something of a local legend, thrilling audiences with his deep blues vocal style. None of this is lost on other stalwarts of the Boston blues scene, such as Mighty Sam McClain, Susan Tedeschi, Ronnie Earl and Bruce Katz. "You've got to hear Willie" is repeated almost like a mantra by them. Now, with the release of At Last On Time everyone can, at last, hear Willie.